Reporter: Mr. President, do you think the Cubs will win? Bill Murray: I feel very confident that Clayton Kershaw is a great, great pitcher, but we got too many sticks. We got too many sticks. 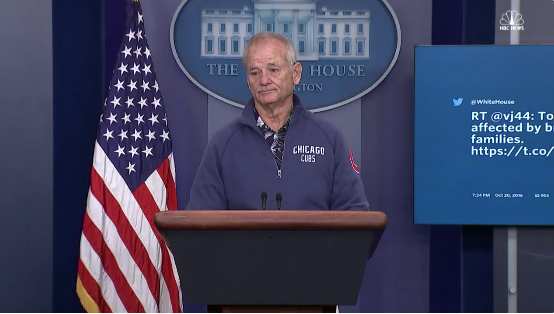 Bill Murray was on hand at the White House to meet with President Obama, as Murray will receive the (well deserved) Mark Twain Prize for American Humor on Sunday. 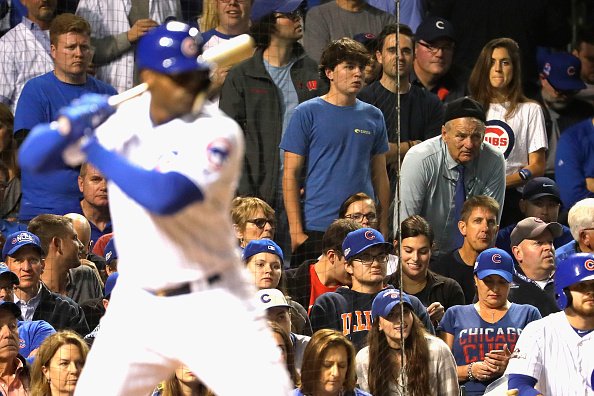 The actor is a huge Cubs fan, and has been in attendance at Wrigley Field for Cubs games this postseason. Due to the award he’s about to receive, we’ll have to assume Murray won’t be able to make Game 6 of the NLCS on Saturday night at Wrigley, as well as a potential Game 7 on Sunday night. But, if the Cubs can win one of those games, expect Murray to be back chugging beers at Wrigley later next week.